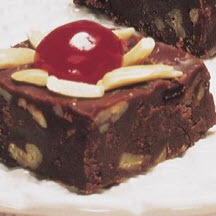 Quick and easy chocolate fudge, laced with bits of maraschino cherries and pecan pieces. Line 8-inch square pan with foil. Lightly press chopped cherries between layers of paper towels to remove excess moisture. Place butter in medium microwave-safe bowl. Microwave at HIGH (100%) 1 minute or until melted; stir in powdered sugar, cocoa and evaporated milk until well blended. Microwave at HIGH 1 1/2 minutes; stir vigorously. Microwave at HIGH an additional 30 seconds at a time, until mixture is hot, slightly thickened and smooth when stirred. Do NOT boil. Stir in chopped cherries, pecans and almond extract. Spread mixture into prepared pan. Cover; refrigerate until firm. Remove foil; cut into squares. Garnish with cherry halves and slivered almonds pressed lightly onto fudge, if desired. Serve cold; refrigerate leftover fudge. Makes about 4 dozen pieces.